Kidney disease, in the form of Chronic Renal Failure (CRF), also called Chronic Kidney Disease (CKD), is a common problem in older cats. I have seen natural kidney failure in cats as young as 4 years, but it occurs far more frequently in much older cats. However, due to the melamine contamination of pet food in 2007, a great many cats (and dogs) developed Acute Renal Failure due to the poison. The tens of thousands of pets who got sick but recovered are likely to have some kidney impairment in the future, and the principles of treating CKD will also apply to them. The most noticeable symptom is an increase in water consumption and urination (“drink-a-lot, pee-a-lot syndrome”). A blood test should be done if you notice these symptoms, as there are several conditions that can cause this. The increase in drinking and urinating in CKD is due to loss of the kidney’s ability to concentrate the urine. The kidneys have a very large reserve capacity, and symptoms of failure are not seen until approximately 75% of kidney tissue is nonfunctional. In my experience, kidney failure is the most common cause of death in older cats. Laboratory tests are needed to definitively diagnose CKD. A blood test alone is usually not sufficient; a urinalysis must be taken at the same time the blood is drawn. Kidney disease is likely present when the cat is “azotemic” AND the urine is not sufficiently concentrated. “Azotemia” means that there is an increase in particular compounds in the blood; specifically blood urea nitrogen–BUN–and/or creatinine. The measurement of urine concentration is called Urine Specific Gravity (USG). If the cat’s USG is less than 1.035 (1.030 in dogs) AND azotemia is present, then kidney function is abnormal. BUN and/or creatinine may be high if the animal is dehydrated (common in cats who eat a lot of dry food, or during hot weather or after a stressful car ride). They may also be increased in animals on a high protein diet. As long as the kidneys are able to concentrate the urine, small elevations in BUN and/or creatinine are usually not a cause for alarm. Long-term feeding of an all-dry-food diet is also suspected as a factor in CKD. Cats’ kidneys are highly efficient and adapted to life in the desert, where they would get most or all of their water from eating their prey. Cats eating dry cat food take in only half the water that cats on a canned or homemade diet get; this chronic dehydration can cause stress on the kidneys over time. Dry diets also predispose cats to lower urinary tract disease (FLUTD, LUTD, FUS, crystals, stones, cystitis) because they force such a high degree of urine concentration. Chronic or recurrent bladder disease may also be a factor in the development of CKD. CKD is considered progressive and incurable (although this may not be 100% accurate; see Traditional Chinese Medicine below). When the process is advanced, scarring causes the kidneys to become small and lumpy, and the amount of functional tissue is greatly limited. The most significant problems caused by the loss of function are dehydration, build-up of blood toxins, and anemia. These can cause weight loss, lethargy, vomiting, loss of appetite, weakness, and other signs of illness. You may have heard that restricting protein is recommended for cats in kidney failure. Although this has been the “standard” treatment for decades, as far as cats are concerned, it has always been–and remains–very controversial. High protein/high phosphorus diets will not cause kidney disease in a normal cat, and restricted protein does not prevent kidney failure in a healthy cat. Some experts suggest that protein has no effect on the ultimate progression of renal disease. Research also shows that even very high protein diets do not make renal failure worse in cats (although high protein does worsen the disease in dogs and humans). (One pet food maker recently completed a study it claims shows that its restricted-protein diet increases lifespan in CKD cats. However, because the study has not been published, it is impossible to evaluate the data, which is contradicted by other research.) The real culprit is actually phosphorus, which meat contains in large amounts. The only practical way to restrict phosphorus is to restrict protein. Decreasing phosphorus intake (by restricting protein) can help some cats feel better, so it may be worth a try in a symptomatic cat. Adding a phosphate binder may also be needed. However, some studies have suggested that excessive restriction of protein may actually cause further damage to the kidneys and other organs, because there is not enough protein for normal body maintenance and repair. Experts say that these diets are not appropriate until the BUN (Blood Urea Nitrogen) is at least double what it should be normally (about 60-80 mg/dl). Let me say this again, because it is the single most important thing to know about CKD: feed the cat anything she will eat! IF THE CAT WON’T EAT IT, IT WON’T HELP THE CAT! Weight loss is your cat’s worst enemy in this disease; so let the cat eat what she wants! Because water balance is so crucial, it is best to feed a high-moisture diet to help keep the cat hydrated; do not feed only dry food. Feeding mostly or only canned food, even though it is high in phosphorus and protein, provides the moisture and calories that these cats need, in a very palatable form that most cats will happily eat. You can also get low-phosphorus renal diets in canned form. Dry cat food causes dehydration even in healthy cats, and is not appropriate for CKD cats (unless, of course, it’s the only food he will eat!). The best thing you can do is feed a home-prepared diet; but only if the cat will eat it! If the cat has never eaten homemade food, or does not have a hearty appetite, this is not a good time to make this switch! There are several good books on home cooking for animals, such as Dr. Pitcairn’s Guide to Natural Health for Dogs and Cats, by Richard Pitcairn, DVM, and Susan Pitcairn. (Rodale Press. ISBN 075962432.) They discuss why a diet made from fresh, raw foods is important, and provide recipes, including a special recipe specifically designed for animals with kidney disease. Another excellent book is Home-Prepared Dog and Cat Diets: the Healthful Alternative by Donald R. Strombeck, DVM. (Iowa State University Press. ISBN 0813821495.) If you choose to use Dr. Strombeck’s recipes, I suggest substituting 1 capsule of taurine (250 mg) for the canned clams, since clams do not contain enough taurine for proper maintenance. Or visit Dr. Lisa Pierson’s website CatInfo.org for detailed articles and instructions on homemade cat food. Practitioners have found that several herbal formulas may be helpful in slowing and even reversing early chronic kidney disease, and reducing inflammation in the kidneys. Please consult the AHVMA directory to find a practitioner near you. A nutritional supplement called “Renafood” from Standard Process, is a very good renal detoxifier and helps to maximize kidney function in cats. Give one or two a day. Most cats eat them readily if they are crushed into the food. They also have a specific formula for cats, Feline Renal Support, that I have had good reports about. Call Standard Process at 1-800-558-8740 to find a distributor in your area. Renafood is a human product, which in my experience works much better than their cat product Feline Renal Support, so be sure to insist on Renafood. Remember, though, that the basic diet is the most important factor in your cat’s health, and no supplement will make up for poor quality nutrition. For more info on feeding, choosing a good food, and switching to a better diet, see the article library. Recent resesarch shows a benefit from probiotics (friendly bacteria) in cats with CKD. Kidney blood values (BUN and creatinine) decreased significantly when cats were given a probiotic product in canned food. This probiotic is now available as Azodyl™, which your veterinarian can prescribe. Your veterinarian can give your cat subcutaneous fluids in the clinic, or teach you how to give them at home. This is the least intrusive and most beneficial treatment you can give your cat. Cats in chronic renal failure drink a lot of water, but they cannot drink enough to compensate for the loss of water through the kidneys. Subcutaneous fluids are an excellent way to help keep the toxins flushed out of the bloodstream and make the cat feel much better. If the cat is sick or not eating, it may be necessary to hospitalize it for a few days for intravenous fluid therapy, followed by subcutaneous fluids at home as needed. (Click here for detailed instructions). The recent development of a semi-permanent “port” that can be inserted in the cat’s skin has taken much of the hassle out of this procedure; talk to your vet about having this installed. It is best to have this procedure done by a veterinarian who has lots of experience with these ports since there can be many complications. Homeopathy, herbs, essences (such as Spirit Essences), or acupuncture may be able to help your cat feel better and live a better quality of life. Click on this link for a directory of holistic veterinary practitioners by state. An amino acid combination called RenAvast is being promoted to “reverse” kidney disease in cats. They do have one study that generally supports the product, but the data is not strong, and the conclusions they draw may be overly broad and optimistic. Nevertheless, veterinarians are using the product with some success in cats, both in terms of lab values and clinical response. Please discuss it with your veterinarian if you would like to try this product, as it is a prescription product. 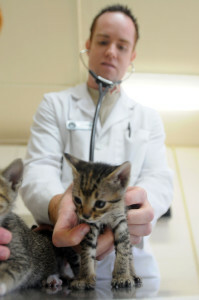 My alma mater, Colorado State University, is actively researching stem cell therapy for feline CKD. Currently (October 2011) it is strictly experimental; it’s also difficult and potentially dangerous, as well as expensive. Please click here to read Dr. Patty Khuly’s article on the current status and future of stem cell therapy in animals. The Feline CRF Information Center is an incredible website devoted to cats in renal failure. You can find out just about everything there is to know about this disease here, as well as explore a host of excellent links to other feline health sites. You can also sign up for their email list, which can be a great resource and support for guardians of CKD cats. Ultimately, fighting CKD is a losing battle, and may carry a great emotional cost to the family. Losing a beloved cat to CKD is just as traumatic as losing a human family member, but friends and family don’t always understand. There are many resources to help you through the difficult times and tough decisions you will have to make for your cat, and to support you afterward. Many of these are listed on the Feline CKD pet loss support page. Click here to read Floppy Cats’ interview with Dr. Jean about kidney disease.